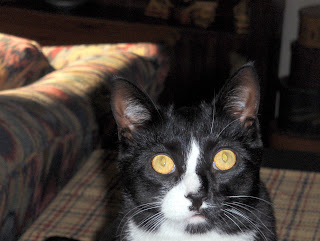 Thanks to a Friend & Cats Will Take Over the World! Well, here I am at Typepad! This blog is a "Work in Progress". I will get there but who knows how long it's going to take to get there. I first want to give a big shout out and to Tiennie of Tiennie Knits. She has been a life saver through out this move. She gave up hours on Sunday evening to help me. Now she won't even let me send her a little gift to repay her kindness. Oh I have an idea! Does anyone have Tiennie's last name and mailing address? She will not give me to me. I need this info for this little nothing I want to send to her. Please email me if you have this. OK, now I want to show you this cute little video how smart cats can be. What do you think about that? I don't know if my Jake could play the piano or not. However, given his God given talents, I'm bett'n he could! Well like I said I'm pretty happy in my new domain. I hope everyone is having a great sunny Friday. Again, Tiennie thank you so much. Hey all! I've moved from my old blogger site to here! Hope you stop by often. I Have Some New Sheeps! Look at these Little Sheeps! Are they not the cutest? I could not resist them. 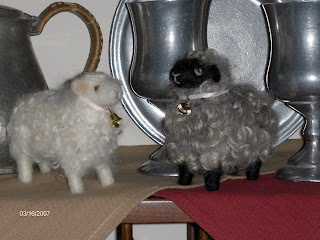 Sheri from The Loopy Ewe purchased the white sheep and put a picture up on her blog. Well, of course I had to check it out and ended out on Laurie Sharp's Shop Woolpets or check out her Etsy Shop. I first purchased the white sheepy and then a couple of days later purchased the gray sheepy to keep her company. I haven't named them yet. But rest assured I will. Laurie is a true artist in this animal felting. She does an excellent job. Oh I forgot she also sells kits in her shop that you can felt you own animal or critter. I think they are adorable. Look! Oh My Gosh! A Knitting Lobstah! Look Here! The cutest Little Knitting Lobstah you have ever seen! Now, I know you are going to be jealous. But you don't have to be for long because you can get one at Isabelle's Store. That is if she still has them. Do you want to see the knitting lobstah? You know he or she is from Maine? Well, okay, here ya go: Ta Da: Guess what. Isabelle has also started a Sistahood Knitting Group for all the Lobstah owners. Those who own the ornament already or are going to can join at: I know of at least two knitters who need these cutie. You will love the Knitting Lobstah Ladies. Believe me!